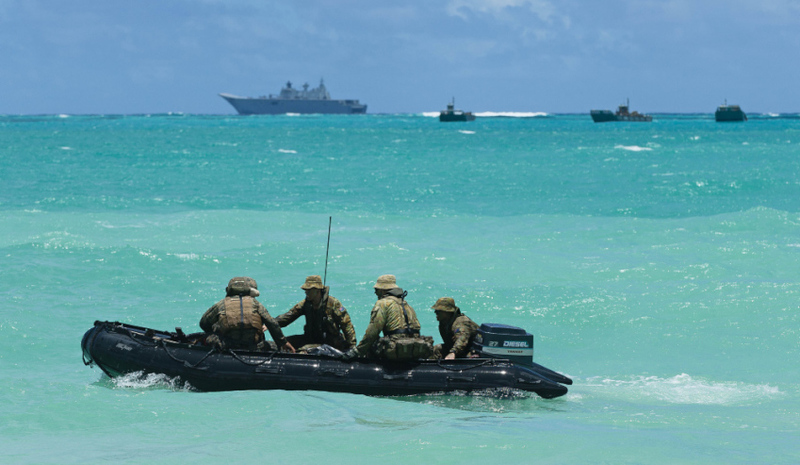 Troops and vehicles from the 2nd Battalion, Royal Australian Regiment and 2nd Battalion, 3rd Marine Regiment prepare to beach a Zodiac at Bellows Beach, Oahu as part of Exercise Rim of the Pacific (RIMPAC) 2016. HMAS Canberra and three of her four LHD Landing Craft can be seen in the background. Image via Commonwealth of Australia, Department of Defence. Australia has thrown its support behind the US decision to withdraw its invitation to China to participate in multinational naval exercise, Rim of the Pacific 2018 (RIMPAC). The move to withdraw the invitation comes as tensions over the South China Sea continue to rise. Just last week, China landed bomber aircraft at Woody Island in the Paracel Island chain. A statement from the Pentagon said, "China’s behaviour is inconsistent with the principles and purposes of the RIMPAC exercise" and has "disinvited the PLA Navy from the 2018 Rim of the Pacific (RIMPAC) Exercise". China's Defence Ministry defended the move, reaffirming the country's belief that the South China Sea is its sovereign territory. "China has indisputable sovereignty over the islands and their adjacent waters of the South China Sea. It is the natural right of China as a sovereign state to carry out construction activities and deploy necessary defense facilities on its own territory, which is also a necessary measure to firmly safeguard national sovereignty and security and maintain regional peace and stability," the Defence Ministry said. China has previously been a participant in the international RIMPAC exercises in 2014 and 2016. Australia has been a major participant in the naval exercise for many years and will take part in this year's exercise. Australia's Minister for Defence Marise Payne told Defence Connect Australia's position on the South China Sea remains "unchanged", and that the decision remains that of the US. "Exercise Rim of the Pacific is a United States-led exercise and participation in the activity is a matter for the United States," Minister Payne said. "Australia looks forward to RIMPAC 2018 and to co-operating closely with the US and other participants on maritime security issues. "Australia’s position on the South China Sea remains unchanged." Minister Payne said Australia has expressed its concern at the recent provocations taking place in the South China Sea. "We have regularly expressed concern at ongoing militarisation of disputed features in the South China Sea," Minister Payne said. "And we urge all claimants to refrain from destabilising actions, including the deployment of advanced military equipment to disputed features. "We have raised our concerns about militarisation in the South China Sea as part of our enduring, broad dialogue with China." China's Defence Ministry has condemned the move by the US, saying it is not constructive for co-operation between the two countries. "The US’ decision is not constructive. Closing the door of communication at any time will not help enhance mutual trust and co-operation between the two militaries," said Senior Colonel Ren Guoqiang, a spokesman for China's Defence Ministry.